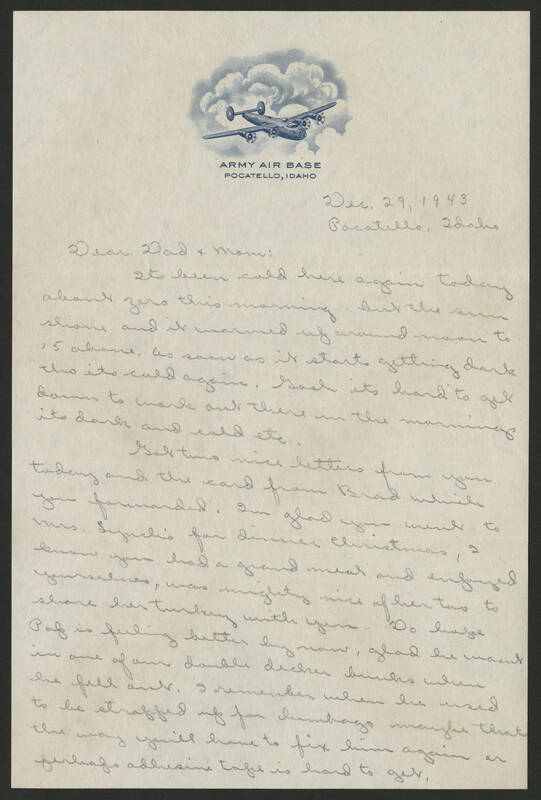 Dec. 29, 1943 Pocatello, Idaho Dear Dad & Mom: Its been cold here again today about zero this morning but the sun shone and it warmed up around noon to 15 above. As soon as it starts getting dark tho its cold again. Gosh its hard to get down to work out there in the mornings its dark and cold etc. Got two nice letters from you today and the card from Brad which you forwarded. Im glad you went to Mrs. Lynch's for dinner Christmas. I know you had a grand meal and enjoyed yourselves, was mighty nice of her too to share her turkey with you. Do hope Pap is feeling better by now, glad he wasnt in one of our double decker bunks when he fell out. I remember when he used to be strapped up for lumbago maybe thats the way you'll have to fix him again or perhaps adhesive tape is hard to get.